The last Steering Committee meeting took place on the 17 of March 2016 in the village of Trud nearby Plovdiv. The results of the Project were presented. Members of SC shared their satisfaction with the achievements of project results and deliverables.Participants discussed how they can be utilized best in the future. 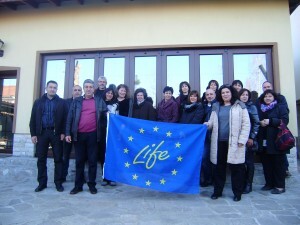 The last SC meeting attended most members of the Council – representatives of RIEW Plovdiv; NPD “Central Balkan”; Office Plovdiv of NAAS; municipal administrations; South Central Forest Enterprise; Laboratory Biologically Active Substances of IOCh BAS; Bulgarian Association of herbs and mushrooms collectors; Regional radio stations “Plovdiv” and “Stara Zagora” of BNR; experts. channel two of the Bulgarian National Television – BNT2! The film “The Medicinal Gold of Bulgaria” is online! The film “The Medicinal Gold of Bulgaria” is coming soon! The Medicinal and Aromatic Plants Fair will be held on November 6 and 7, 2015 in the Agricultural University of Plovdiv. Herb collectors, buyers and processors, farmers, and entrepreneurs, as well as all those interested in developing a livelihood, connected to medicinal plants in the Plovdiv district and the rest of Bulgaria will take part in the event. The Fair is being organised by Foundation Information and Nature Conservation, in partnership with the administration of the Agricultural University, as part of a project co-funded by The European Commission’s financial instrument for the environment – Life+. The event will be widely publicised by national and regional media. Premiere of a film about good practices and examples of the sustainable use of wild medicinal plants as well as their cultivation, created during the project. You are welcome to attend! Take part in this forum for the exchange of ideas, experience and information about medicinal plants! The Medicinal and Aromatic Plants Fair will be held on November 6 and 7, 2015 in the Agricultural University – Plovdiv. For more information, please click here. 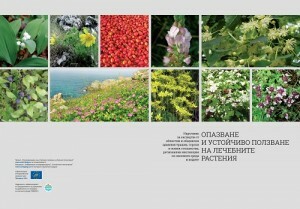 A manual for preservation and sustainable use of medicinal and aromatic plant species and habitats has been published. The publication is designated for experts from authorities, charged with issuing MAP collection permits. It represents the wealth of medicinal plants in the country and gives an overview of the international and national legislature regarding their management. The handbook includes lists of conservationally significant species and data on cultivated species. Color photos depict some of the most collected, economically significant MAP species. 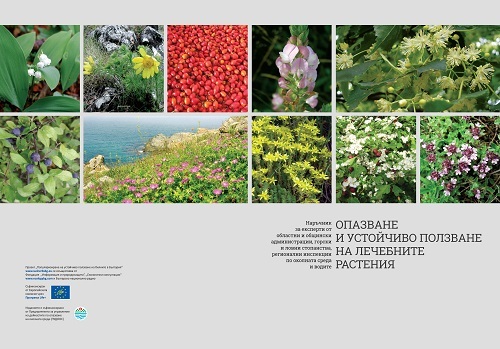 The book will facilitate the work of resource management specialists and be of use to lecturers, students, herb buyers, nature lovers and anyone interested in Bulgaria’s wealth of herb species. The electronic version of the handbook can be downloaded in Bulgarian here. Preview the electronic version of the handbook or download it in Bulgarian here. In March 2015, information meetings took place in six locations accross the Plovdiv district. Farmers, herb collectors, buyers and processors, as well as all parties interested in a livelihood based on medicinal plants received information and a private consultations at the events. 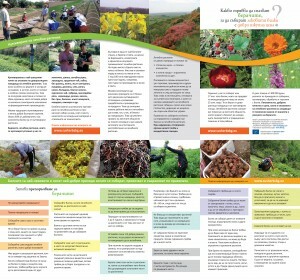 Some of Bulgaria’s leading experts answered questions about: collection and processing for the production of quality herbs with good market value; species, technologies, planting material for the clutivation of medicinal plants as well as measures for financial aid of farmers and entrepreneurs who cultivate medicinal plants and process herbs as part of the Rural Development Programme 2014-2020 г. The consultations were organised in cooperation with the regional office of the National Agricultural Advisory Service in Plovdiv. Presentations on the main topics (in Bulgarian) can be downloaded here. Instructions for the cultivation of some of the most widely used species can be found here. You can listen to the radio broadcasts (in Bulgarian) about the sustainable use and cultivation of medicinal plants can be heard here. 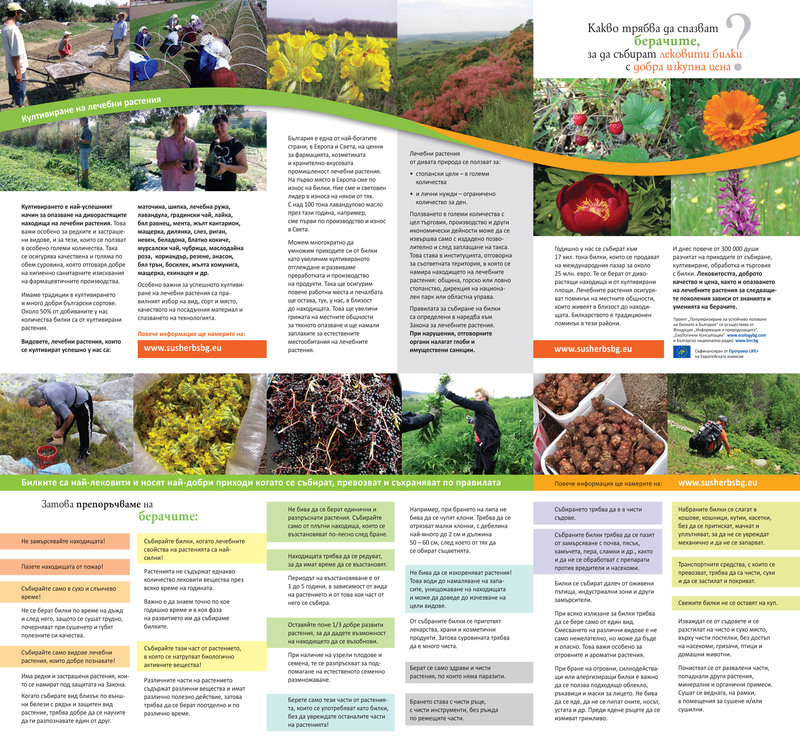 Consultations for farmers, herb collectors and other parties, interested in a livelihood from sustainable herb use, will take place on 12-27 March 2015, from 9:30 to 16:00 in Plovdiv region. For additional information in English, please contact the project team! 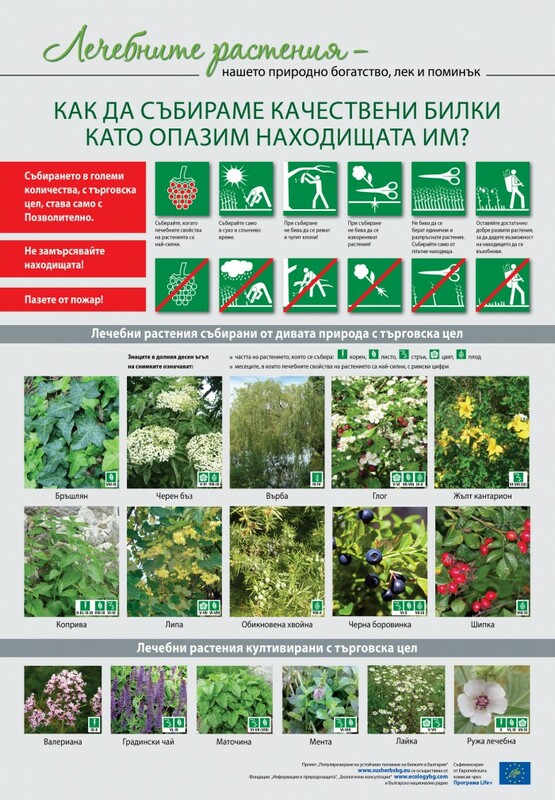 The “Gathering Quality Herbs while Conserving Their Habitats” poster, which presents sustainable medicinal plant collection rules was created and distributed in the active collection season of 2014. 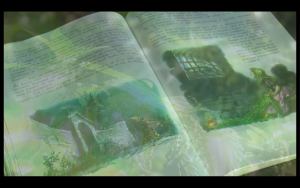 It contains information about the most popular MAP species gathered and cultivated for economic purposes. The rules within it are to serve collectors and aid the sustainable use of herb resources. A leaflet, primarily targeting collectors has been issued by the project team! It gives a detailed explanation of the rules, which must be kept in order to ensure good collection practices and includes the most essential advice for MAP cultivation. Important practical information and contacts of the project team are also included, in order to encourage further research and questions from the target audience (collectors and buyers of medicinal and aromatic plants; farmers interested in cultivation of MAPs; entrepreneurs; all “clients” of the Mobile Info Center, and the attendees of the MAP Fair). *A high quality digital version of the leaflet or the poster are available for print reproduction upon request! Please use the website contact form to request it!